Like Mordecai, the faithful will have a sense of impending doom. Like Mordecai, they will discover plots against power. Like Mordecai, the just are rewarded for their fidelity and courage. It will be this very reward that puts them in danger; yet they be saved from destruction, tribulation and distress. And there will always be Haman lurking behind the curtain . . . hoping to destroy the just. When we act in and for God, we must anticipate jealousy and envy. And we must rely on God alone to save us from annihilation. Mordecai receives information in a dream and although he trusts this information he does not understand its deeper meaning and its long-range implication. And so he kept it mind, and tried in every way, until night, to understand its meaning. I am wondering how much energy we put into understanding a message we receive darkly. I am thinking that Mordecai shows us how to remain in and with God despite intense, justified fear. Jesus also sends us into the fields as laborers. We are also sheep among wolves as was Mordecai. I believe that we cannot stop evil, but I also believe that when we remain in and with God, we are protected in his strength and guided out of harm’s way. We are loved beyond measure and we must learn to trust this love. We must learn to give over to God the clawing fear that grabs at us when we feel alone in a hostile world. We must remember to lay our turmoil in God’s capable hands when there is tribulation and distress, evil and great confusion. We must carry our burdens – whether they be light or heavy, small or great – to the one who knows all and to the only one who can confront and even annihilate evil. The psalmist says in Psalm 27: The Lord is my light and my help; whom shall I fear? The Lord is the stronghold of my life; before whom shall I shrink? When evil-doers draw near to devour my flesh, it is they, my enemies and foes, who stumble and fall. Though an enemy encamp against me even then would I trust. It is your face, O Lord, I seek; hide not your face . . .
God has shown us his face and it is the face of Jesus. God has rescued his people and he abides among them. God has brought us into his eternal Spirit and he dwells within us. The race of the just will always be saved. Let us gather ourselves – we the lambs among wolves – and go quickly and surely to the only sanctuary there is that can withstand the darkness of evil. Let us run to greet the newness we are granted by the one who loves us so well. Let us find refuge in the power and presence of the one who will always save the race of the just. A re-post from October 19, 2011. Yesterday we assessed the narcissism we might discover in ourselves and how unilateral listening governs our world circumstances. Today we reflect on how Esther and Mordecai operate in their world – and what we might learn from them. It is clear that Haman is consumed by envy of Mordecai and while we cannot analyze this character from a Biblical story, we can certainly learn from his actions. It is also clear that Esther – as a woman but especially as a Jewish woman in a non-Jewish court – fears for her life, and the life of her nation. The kingdom of Xerxes is an ancient one in which individual rights are denied to most. We might believe that we as a species have evolved and it is true that in general, we have. However, many peoples in our modern society have no benefit of personal rights. When this happens, we might speculate, it is often the result of someone, or some group, behaving in a narcissistic manner. Navigating these troubling conditions is difficult at best. What does the story of Esther have to tell us? Queen Esther answered, “If it please Your Majesty to grant my humble request, my wish is that I may live and that my people may live”. Humility is usually an ineffective tool against brutality; it seems to encourage even more violence. Yet, here we see that despite her humble behavior and words, Esther acts in order to save a people. On Ash Wednesday when we explored Chapter 4, we considered Martin Neimöller’s advice that if we do not speak against evil and injustice, we guarantee not our safety, but our sure demise. Despite their fear, Esther and Mordecai form a solidarity of two as they begin a quiet, patient assertion of justice and truth. An article from Psychology Today gives us guidelines to manage the effects of narcissism. These experts advise that we evaluate both our surroundings and the narcissist to look for context, that we maintain a firm sense of purpose along with a sense of humor, and that we remain realistic about how much we can accomplish when working with the self-centered. If we are in dangerous surroundings, controlled by a persecutor as Esther and Mordecai are, we begin by turning to God and finding others with whom to form solidarity. We move forward with patience, reliance on the Creator, persisting in hope, and acting in mercy. When we read varying translations of this story by using the scripture link and the drop-down menus, we find an opportunity to transform a world beset by narcissism. We must take care to observe what schemes we enter, knowingly or unknowingly. In today’s reflection, a parade of characters brings us an invitation to explore our own motivations and actions. Queen Esther waits beyond the throne room, knowing that entrance without permission results in death. Does she know that she will need more courage than she believes she possesses? King Xerxes offers half his kingdom in a magnanimous gesture. Does he know what price he will actually pay for this promise? Haman wells over with envy and anger. Does he understand what happens to plotters and schemers? Haman’s wife Zeresh urges her husband to build an execution scaffold. Does she understand who will eventually stand on its trapdoor? Mordecai insists on worshipping no other god before Yahweh. Does he know that the LORD will protect him? These characters invite us to explore what gallows we build for ourselves and others. They call us to examine our goals and incentives. They ask us to open ourselves to the possibility of conversion and mercy. We use the scripture link and the drop down menus to compare varying translations of these verses. We explore more about the lives of the characters in this story today. A Favorite from October 6, 2007. When we explore Esther’s story, we discover God’s gift of goodness. How many times has this kind of rescue happened in small ways in our lives that we have given momentary thanksgiving and moved on to our next petition in our list of dreams? How many times have we quickly curtsied or bowed as we said a hasty “Thank you” before rushing on to out next request? We must always make the time to give full and abundant thanks to God. For has not God’s goodness been overflowing to us? We must pass along these stories to those who follow. For have not these stories been passed along to us? We must, like Mordecai who realizes that his highest hopes have been born out of God’s providence and mercy, gather together with joy and happiness before God that we may celebrate. We must rejoice in the goodness of God for only this gladness and joy will carry us forward to New Life in the fullest. When we spend time with the story of Esther, Mordecai, Haman and Ahasuerus, we open our hearts to thanksgiving. We open ourselves to the Spirit. This week we spend time with Esther 3 (B) today and consider it as preamble to new grace and blessings. We see how God’s grace enters Mordecai, Esther and Ahasuerus. We see how God’s power comes through a vulnerable and frightened, yet brave woman. We see how God acts through inversion. We see how God dwells with the lowest and the poorest. We see how God guides, protects, calls and loves his faithful. We see a foreshadowing of God’s most wonderful gift to come, the saving and redemptive power of the gift of Christ. Mordecai remains true to his God and for this he draws the venomous envy of Haman. He goes to God when the decree of destruction is read out, and he does as God asks . . . he goes to Esther. Esther remains faithful to God and believes that God loves and protects her even as he calls her to take on in a dangerous mission. She overcomes her fear and acts from her position of weakness, not from any strength, to become an agent for good. Jesus comes to live among us as one of the world’s most helpless. In this way, he places himself in our hands . . . and asks that we place ourselves in his. This is the amazing story of Jesus that we know so well. This story of Esther is a fitting preamble to understanding the gift of Christ. Let us spend some time with this story, and with Christ, today. Adapted from a reflection written on December 25, 2010. This week we spend time with Esther 3 (B) today and consider it as preamble to a new simplicity. God’s sign is the baby in need of help and in poverty. Exactly the same sign has been given to us . . . God’s sign is simplicity . . . God’s sign is that he makes himself small for us. This is how he reigns. He does not come with power and outward splendor. He comes as a baby – defenseless and in need of our help. He does not want to overwhelm us with our strength. He takes away our fear of his greatness. He asks for our love: so he makes himself a child. He wants nothing other from us than our love, through which we spontaneously learn to enter into his feelings, his thoughts and his will – we learn to live with him and to practice with him that humility of renunciation that belongs to the very essence of love. God made himself small so that we could understand him, welcome him and love him. We might reflect on the life of Esther in a similar way. God sends a sign to his people through a woman who is considered an appendage of her husband, for the queen in this kingdom is not allowed to enter into the king’s presence without his permission. In this time and place, Esther’s intrusion on her husband’s time and person is punishable by death and so we see that God’s sign comes to his people through a woman who has been taken as part of the household of a pagan king and who fears for her life whether she remains silent or speaks. God comes to his people through this defenseless woman who is in need of someone’s help. When we read her story, we might imagine ourselves as equally defenseless, equally frightened. If we allow ourselves to accompany Esther as she listens to her uncle Mordecai tell her that she has been chosen by God to speak on behalf of her people, we will watch as she opens herself to allow God into her life fully. If we watch what happens to the man, Haman, so filled with hatred that he plots the deaths of thousands in order to have his bruised pride assuaged, we will see Ahasuerus deliver to Haman the consequence of his own plots against God’s people. Cameron, Peter John, Rev., ed. “Mini-Reflection.” MAGNIFICAT. 25 December 2010. Print. Much like the Book of Judith, the story of Esther is another that is full of danger and violence but this time counterpointed by trust in God . . . and great rejoicing. Today and tomorrow we discover that despite palace intrigue, envy and anger, joy is present. If today’s story calls you to search for more surprises, click on the word Joy in the categories cloud in the blog’s right hand sidebar and choose a reflection, or enter the word Joy in the blog search bar. You may also want to visit the Joy for the Journey blog at www.joyforthee.blogspot.com to see how joy surprises you there. Today we find joy in times of massacre and war. Chapter 9 of Esther’s story describes the origin of the Purim festival, a celebration of the Jewish nation’s deliverance. We know that after a plot against these faithful was thwarted and as too often happens when power changes hands, wide-scale killing takes place. Old feuds rise and are settled. Grudges surface and are acted upon. Personal agendas take over. We humans have not moved much past these ancient rituals of slaughtering the conquered. Despite the fact that in many cultures leaders are elected by free and fair elections, too many peoples suffer at the hands of those who see instability as a time to take over, to amass power, and to use corruption as a governing tool rather than social justice or the rule of law. And we need not look to the evening news to find examples of how we repress one another in the hope of currying favor or gaining control. Our workplaces, neighborhoods and even our homes sometimes serve as microcosms of the problems we see on a more global scale. Today we may be horrified at the acts of revenge we read in the Book of Esther. And today we might also be surprised at the elation that sweeps through these people who thought themselves dead. Today we remember that we witness many small killings too frequently in our lives, the killing of the spirit, the killing of the heart, mind and soul, the killing of ideas, hopes and dreams. The killing of innocence. And then . . . let us reflect on how we might find joy in times when insanity reigns and reason disappears. Verses 9:17-23: This was on the thirteenth day of Adar. On the next day, the fourteenth, there was no more killing, and they made it a joyful day of feasting. The Jews of Susa, however, made the fifteenth a holiday, since they had slaughtered their enemies on the thirteenth and fourteenth and then stopped on the fifteenth. This is why Jews who live in small towns observe the fourteenth day of the month of Adar as a joyous holiday, a time for feasting and giving gifts of food to one another. Mordecai had these events written down and sent letters to all the Jews, near and far, throughout the Persian Empire, telling them to observe the fourteenth and fifteenth days of Adar as holidays every year. These were the days on which the Jews had rid themselves of their enemies; this was a month that had been turned from a time of grief and despair into a time of joy and happiness. They were told to observe these days with feasts and parties, giving gifts of food to one another and to the poor. So the Jews followed Mordecai’s instructions, and the celebration became an annual custom. Let us pause and consider how we might refrain from seeking revenge when we have been wronged. Let us mediate on the meaning of interceding for our enemies. And let us celebrate deliverance from evil and killing we too often find in our own lives. For more Noontime reflections about this woman’s story, enter the word Esther into the blog search bar and explore. Read the rest of this story in Esther 9-10. Much like the Book of Judith, the story of Esther is another that is full of danger and violence but this time counterpointed by trust in God . . . and great rejoicing. Today and tomorrow we discover that despite palace intrigue, envy and anger, joy is present. If today’s story calls you to search for more surprises, click on the word Joy in the categories cloud in the blog’s right hand sidebar and choose a reflection, or enter the word Joy in the blog search bar. You may also want to visit the Joy for the Journey blog at www.joyforthee.blogspot.com to see how joy surprises you there. Today we find joy in times of deceitful intrigue. The opening chapters of Esther’s story describe how this young woman, despite her Jewish identity and fidelity to Yahweh, finds herself at the center of a major, political power struggle. Esther’s uncle Mordecai counsels her; and the courtier Haman – full of hatred, envy and pride – plots to kill all Jews in the kingdom. 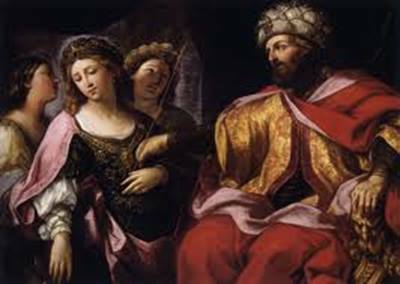 Resenting the power and influence Mordecai and Esther hold with the king, Haman hatches a devilish plot; and Esther finds that the only way for her to survive is to rely on God’s providence and care. In the end, the tables turn on Haman and he suffers the very punishment he had hoped to exact on the Jewish people, death on the gallows built at his own command. Verses 8:15-17: Mordecai left the palace, wearing royal robes of blue and white, a cloak of fine purple linen, and a magnificent gold crown. Then the streets of Susa rang with cheers and joyful shouts. For the Jews there was joy and relief, happiness and a sense of victory. In every city and province, wherever the king’s proclamation was read, the Jews held a joyful holiday with feasting and happiness. In fact, many other people became Jews, because they were afraid of them now. The story of Esther is one we will want to remember when we find ourselves looking for power and revenge. The story of Esther is one we will want to remember when we find ourselves plotting to preserve power or damage another another’s reputation. The story of Esther is one we will want to recall when we find ourselves thrilling to schemes of undoing . . . rather than planning to work in the kingdom of God. Read this story from the beginning at, Esther 1-8.